31.03.2019 -Silvaplana - The 2018/19 FIS Freeski World Cup season capped off with style on Saturday afternoon at Silvaplana's Corvatsch Park with Megan Oldham (CAN) and Andri Ragettli (SUI) taking big victories in what was arguably one of the best contest in the history of freeskiing. Following two perfect training days and spectacular qualifications on Friday, top 8 ladies and top 15 men showed up once again on top of the Corvatsch’s progressive slopestyle course to deliver another world class spectacle and finish up an extremely exciting season of World Cup slopestyle competitions. With five different stops taking place from the end of November 2018 through to this Saturday’s final competition, with a show-stopping turn at the 2019 Utah FIS Snowboard, Freestyle and Freeski World Championships mixed in along the way, the 2018/2019 season has been without a doubt an outstanding one, with the next level in riding, creativity, progression, and course building on display throughout the season. Taking the season’s grand finale to one of the best snowpark in Switzerland was the icing on the cake for 2018/19, as the perfectly shaped features, ideal spring conditions and some of the world’s best riders all came together to make the Silvaplana World Cup event a truly special one. In the ladies’ competition the Canadian rookie Megan Oldham kept her World Cup podium streak alive and went for her third consecutive top-3 finish. Oldham earned a score of 84.51 points and took an indisputable victory with her run of a switch left 270 on 270 out on the first rail, a left 270 safety from the hip and a 450 out on the third feature, followed by a switch left misty 900 mute, right 720 mute, and finished it off with a nice 450 off the canon rail. Not only did Oldham grab her very first World Cup victory, but she also captured the slopestyle crystal glove. With the victory on Saturday Oldham took 100 points in the overall standing, while benefiting from the fact that her biggest competitor for the crystal globe Sarah Hoefflin finished the competition just behind the podium in fourth. With just 50 additional points from Corvatsch it was not enough for Hoefflin to keep the leader position and in the end she had to settle for the second overall spot. It was definitely the closest battle for the slopestyle World Cup title we’ve seen in the recent year, with Oldham edging out Hoefllin by the slightest of margins of only one point. 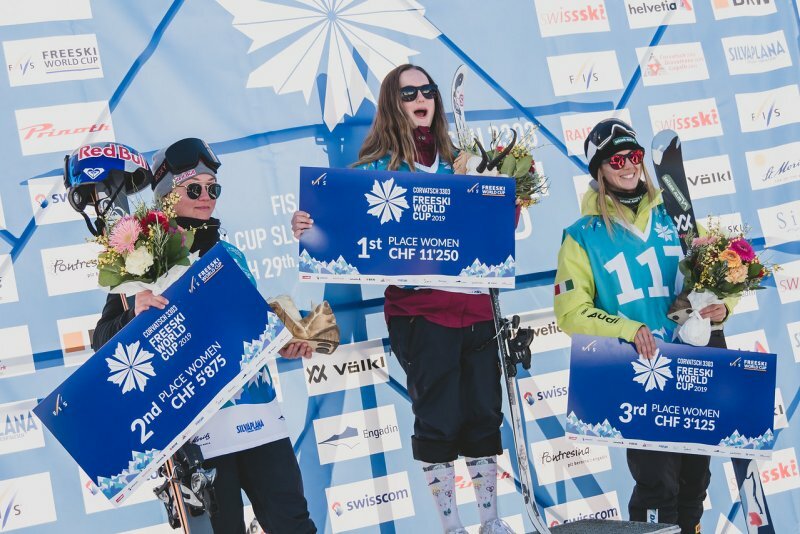 The second place on the day went to Tess Ledeux of France for her first slopestyle World Cup podium of the season, while the Italian veteran Silvia Bertagna rounded out the ladies’ podium in third. Things were equally exciting over on the men’s side of the event with the top qualifier Andri Ragettli of Switzerland stepping it up in his second run. After failing to put a clean run in his first attempt, Ragettli went all in dropping as the last rider of the day, and stomped a switch left in to front switch-up to pretzel out on the first rail, followed by a switch left 450 safety off the hip jump and 270 in to 630 out on the third feature, a switch left dub misty 1080 mute, switch right misty 1260 bow and arrow and a left triple cork 1620 safety on the jump line, as well as a switch 270 in to 810 out to finish things off on the final canon rail. Ragettli received a score of 93.71 for his extraordinary run what was just enough to put the Swiss rider right on top of the podium, for his career’s second victory in Silvaplana’s World Cup event. Making a World Cup podium comeback USA’s Colby Stevenson finished the competition in the second place, while the 2019 big air World Champion and Ragettli’s teammate Fabian Boesch came in third. In the overall standing it was the 17-year-old rider Mac Forehand of USA, who managed to keep his lead over second in the ranking Max Moffat of Canada, as he took home the slopestyle World Cup crystal globe. It was an amazing season for the young US athlete, who scored his first major victory at the FIS Junior Ski World Championships in Cardrona (NZL), where he dominated the big air event. 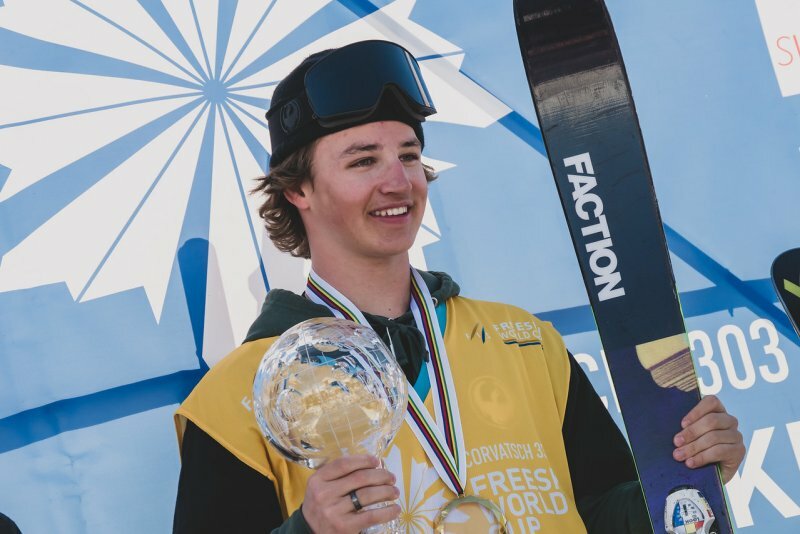 Then he earned his very first World Cup podium at the season’s first slopestyle competition in Stubai (AUT), to back it up with his career’s first World Cup victory a couple of weeks ago at Mammoth Mountain (USA), and now taking home the slopestyle title. Team USA was awarded with the slopestyle Nation Cup, while the overall FIS Freestyle Ski Nation Cup trophy went to Team Canada.